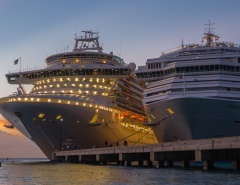 The modern cruise ship market is extremely competitive, and builders utilise the services of world renowned architects. Pacific Dawn is no exception, being designed in 1991 by Renzo Piano, an Italian architect famous for creating expansive people-friendly buildings that incorporate a plaza-like cosmopolitan feel. 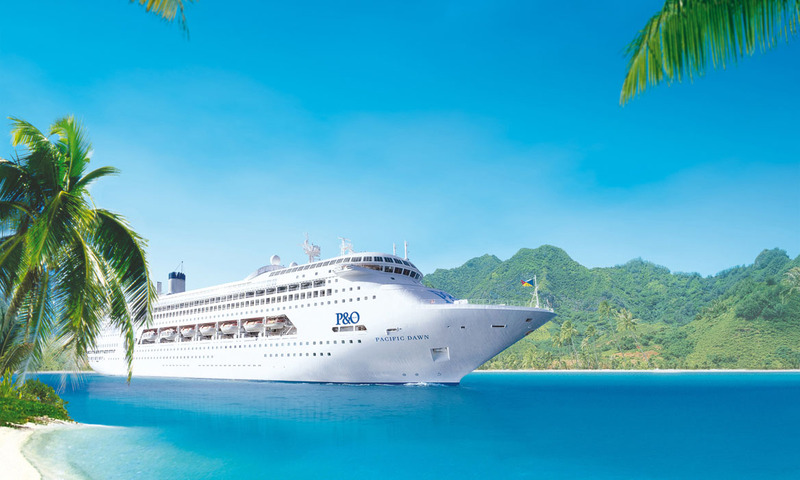 P&O’s Pacific Dawn has undergone several refurbishment and facilities upgrades since its launch, and is now an iconic ship based in Brisbane to take advantage of the ideal climate of tropical Australia and the South Pacific. This slightly older vessel has required some serious upgrades to bring it in line with passenger expectations in 2015. Public spaces have been updated, accommodations are modernised and dining choices have been expanded. 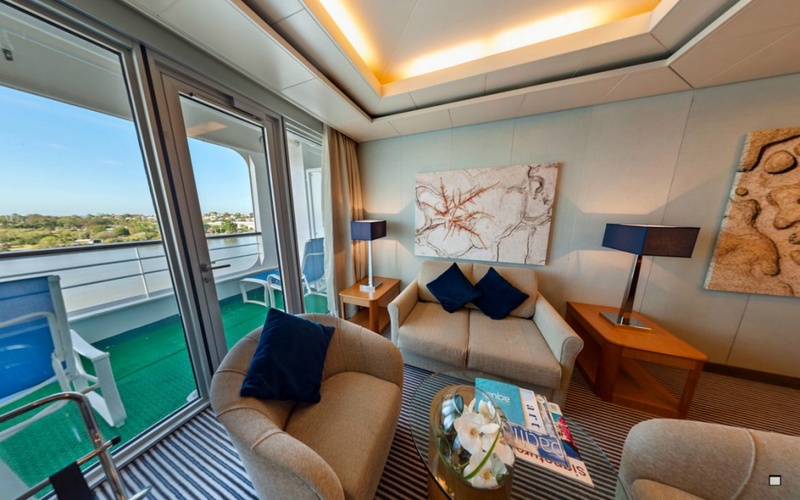 There is more flexibility and facility on Pacific Dawn than ever, and even the age of the ship is a plus as it is solid and sturdy when negotiating the occasional big seas. 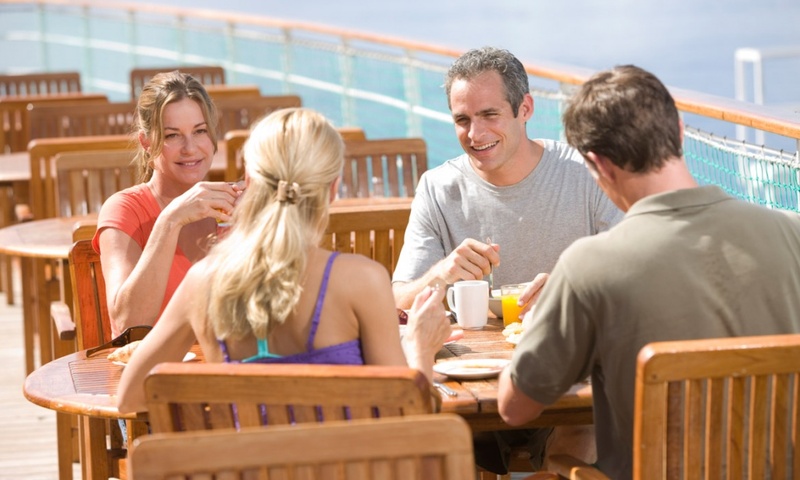 Pacific Dawn has a passenger capacity of 1,950, served by 700 staff/crew. 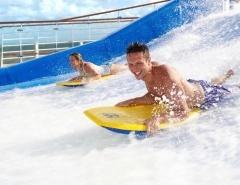 The easy-going nature of Australian cruisers is evident in the casual daytime dress code where swimwear and T-shirts are the norm. However, everyone likes to get dressed up and at night “smart casual” is expected in restaurants and public lounges. Special cocktail nights remain a feature of Dawn cruises, with women and men dressed to suit the occasion. 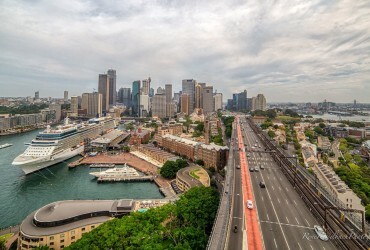 Cruising on Pacific Dawn provides a popular mix of tradition and modernity. 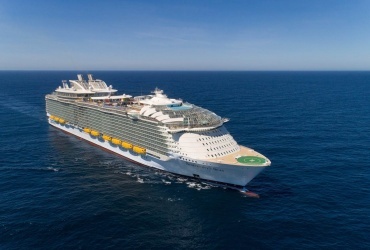 Pacific Dawn has 11 passenger decks, 4 restaurants, 2 swimming pools and 4 jacuzzies. When launched in 1991, Pacific Dawn would have wowed passengers with a generous number of balcony cabins – 184 out of the total 795 cabins. By today’s cruising standards this isn’t a lot of balcony cabins, although refurbishments have improved accommodations overall, with upgrades to the suites and mini-suites, and the addition of interconnecting staterooms that are ideal for families and larger groups. 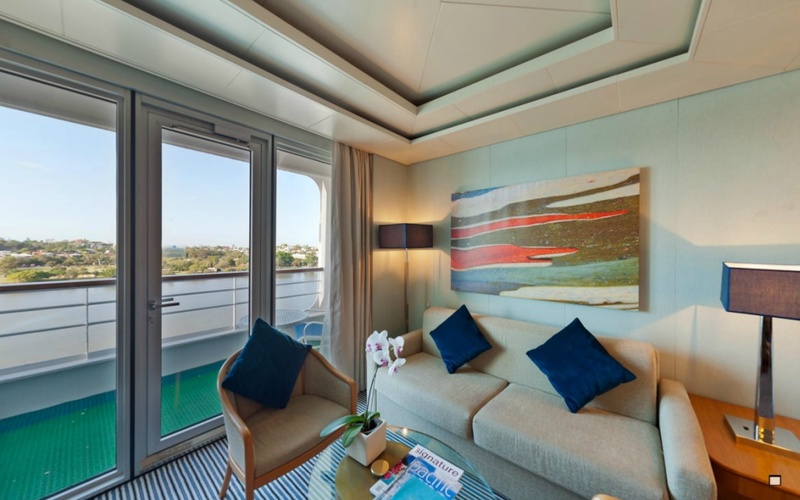 Dawn has 440 outside staterooms, 171 inside staterooms, 134 outside staterooms with private balconies, 14 suites (with balcony), and 36 mini-suites (with balcony). Suites: These larger accommodations sleep four people, and have a large balcony with comfortable outdoor furniture. Other features include a large living area, spacious bedroom, walk-in closet, large bathroom with bathtub and shower, flat-screen TV, DVD player and coffee machine. Additional perks are available for suite passengers, such as complimentary wine, free laundry service, bottled water, and special cocktail party invites. Mini-Suites: Sleeping two or three with a rollaway bed, spacious sitting room with comfortable furniture, good-sized balcony, flat-screen TV, complimentary robe and slippers, plus special welcome gifts that include flowers, fruit and champagne. 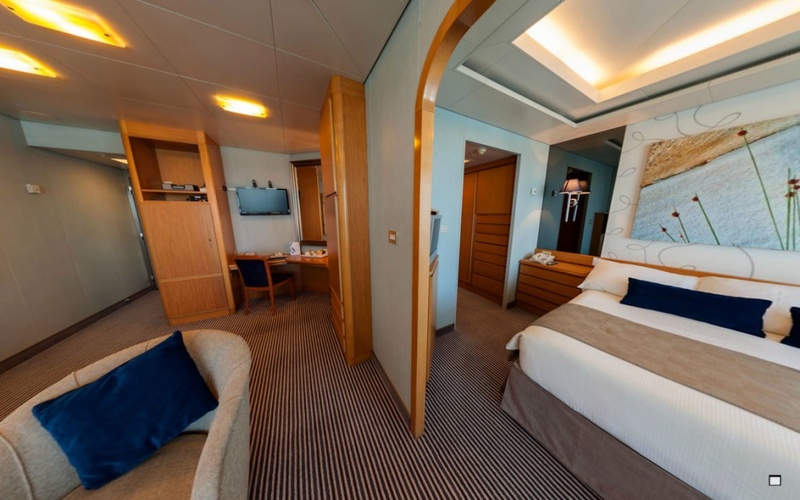 Outside Balcony Staterooms: Sleeps two or three, balcony with furniture, good amount of closet space, sizeable shower, living space with upgraded furniture, desk, chair, flat-screen TV. 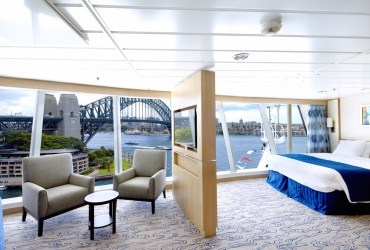 Standard Staterooms (inside/outside): Outside staterooms have a picture window or porthole for viewing outside vistas. 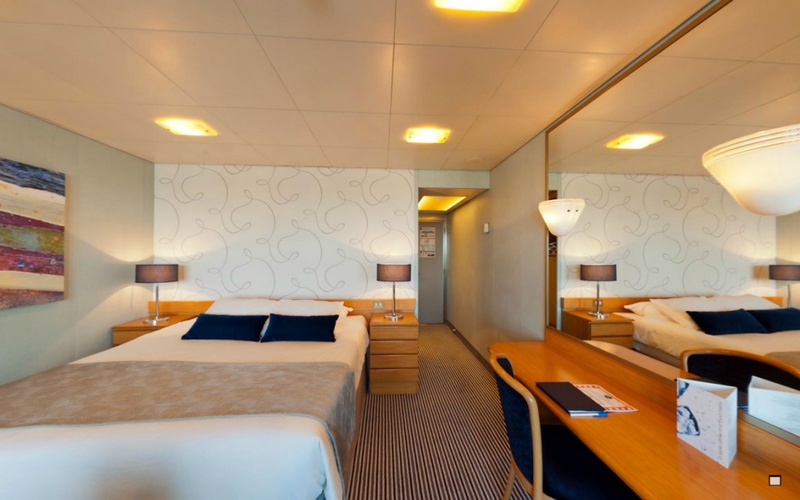 All rooms have a queen size bed that converts into twin beds, plus additional berths for more guests. Some standard rooms connect to outside rooms and are perfect for families and larger groups. 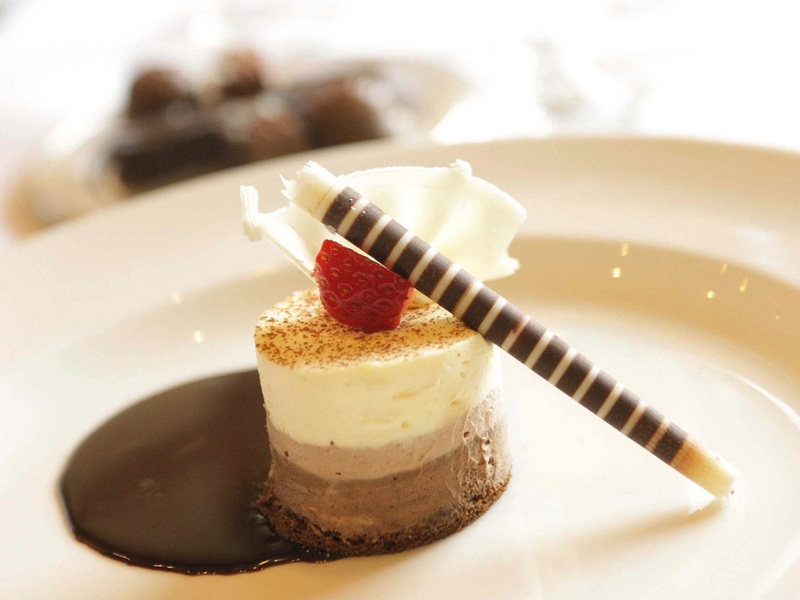 Dining options have improved dramatically on P&O’s Pacific Dawn since its launch in 1991. The major dining venue is the Waterfront Restaurant; a spacious place decorated in contemporary style that offers a range of seating including comfortable areas suitable for couples. In all, seating varies from tables for two up to tables for ten people. The Waterfront Restaurant is open for breakfast, lunch and dinner and offers Your Choice Dining which allows you flexibility of dining times and companions. The offerings are many and varied at every meal time. From healthy fruits and light vegetables, gourmet offerings of prime Australian produce, kids menus and family platters, there is something for everyone. The Plantation Restaurant is a great alternative dining venue for passengers wanting to mix it up a bit. This buffet-style restaurant is also open for breakfast, lunch and dinner. Refurbishments in 2012 have introduced attractive colour schemes and contemporary furniture. Plantation also provides outdoor seating. Breakfast time offers plenty of hot or cold offerings, and lunch options include everything from pasta to roasts. Dinner is similar to the Waterfront, although there are more salad and dessert choices at Plantation. Luna Restaurant, situated at the rear of the Plantation Restaurant, is open for dinner. This contemporary Asian eatery rotates the menu offerings that include delicious Thai and Japanese selections. Salt Grill was added to Pacific Dawn as part of the 2010 upgrade. It is a stylish venue that incorporates a beautifully polished floor and tastefully accented décor. 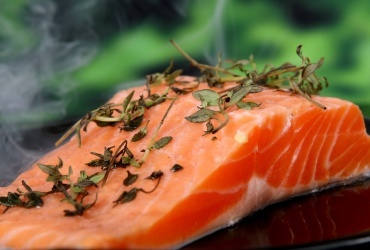 Salt Grill isn’t a free dining experience, but is highly recommended as a special treat for lunch and dinner. The Grill on Deck 12 is an Aussie BBQ favourite for burgers, toasted sandwiches and more. Most items are free, and it is a great option for passengers on the move who don’t need to take time out for a formal meal. Passengers with special diets, such as vegetarian and gluten free can take advantage of a la carte menus, and there are plenty of buffet options. 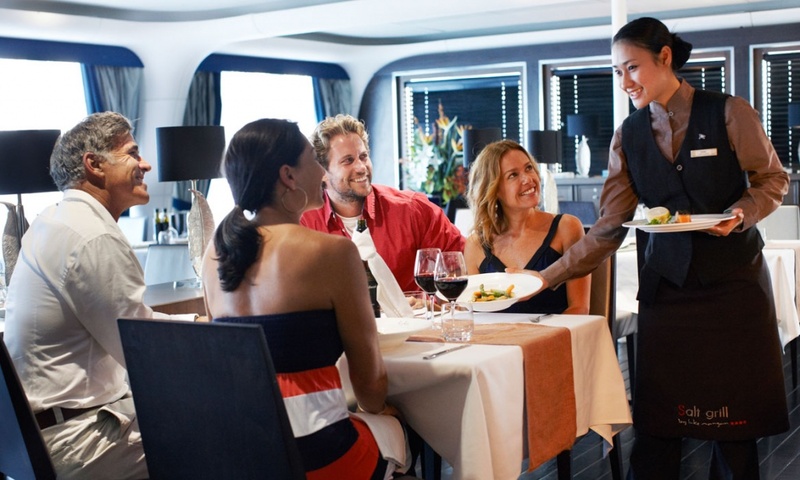 Room service is an alternative cruising treat for passengers who wish to dine in their cabin. 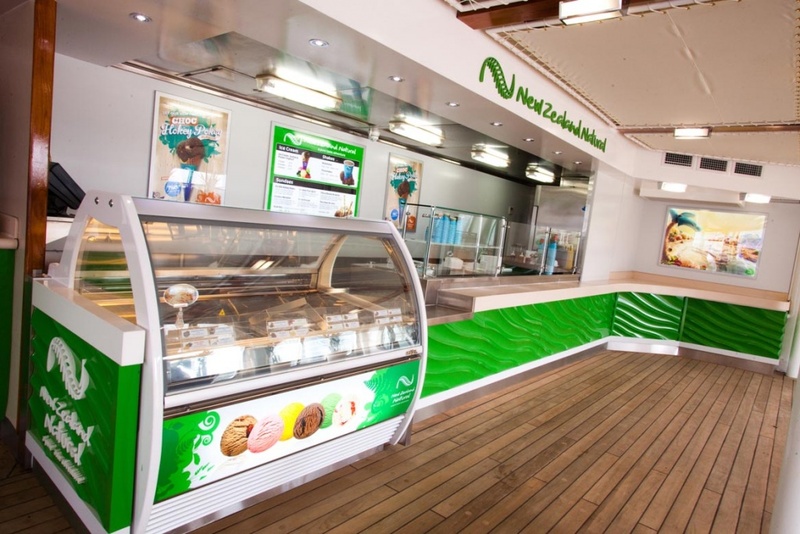 The New Zealand Natural ice cream parlour is a hit with families also. 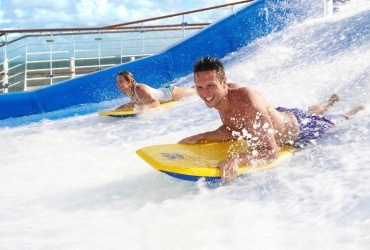 There’s no denying that cruisers are pleasure seekers, and the predominantly Australian passengers on Pacific Dawn are out to have a good time. There is something for all ages and interests on Dawn, from salsa dance to mixology classes, big-screen movies, concert extravaganzas, or just a quiet time soaking up the sun. Broadway-style shows draw the crowds at night, and include the family-friendly Pirates of the Pacific. 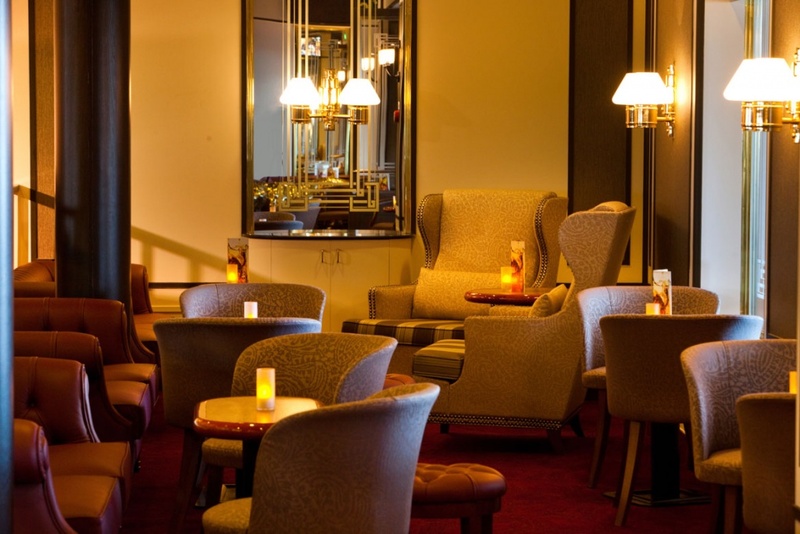 The Promenade Bar: Live music at night makes this public space a great place to meet and mingle while enjoying a drink before or after dinner. The Orient Pub: A great bar with a large variety of beers, comfortable couches and easy chairs, and a stage. This is also the venue for trivia and karaoke nights. Mix Bar: Located above the Atrium, this small cocktail bar offers an impressive drinks range. Dome Bar: A huge Renzo Piano styled establishment featuring contemporary elements. During the day the Dome Bar is a quiet retreat, and at night it morphs into an entertainment venue and nightclub. 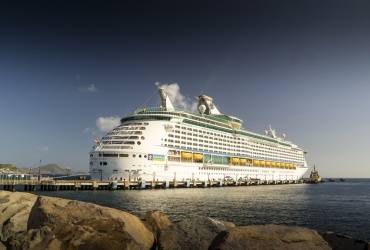 Music onboard Pacific Dawn ranges from crooning soloists to full-blown bands belting out the latest and greatest hits. A highlight among other entertainment is the Pacific Cirque acrobatic troupe, involving daring feats, fire eating and juggling. 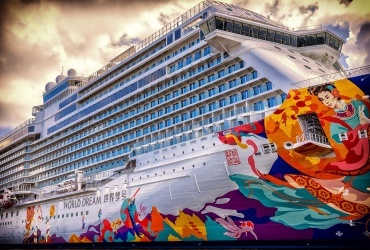 Special themed cruises are also popular on Dawn, and can involve anything from music to fitness, comedy or culinary experiences. 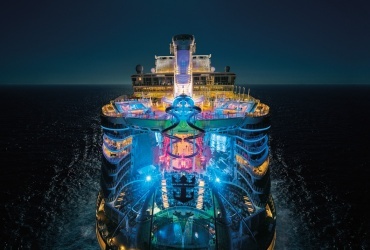 There are two pools on Deck 12, one of which is an adults-only enclave. You will also find two large hot tubs here. The Oasis is a significant adults-only feature courtesy of the 2010 refurbishment. It includes a bar that is open all day, luxury sun loungers and comfortable seating. 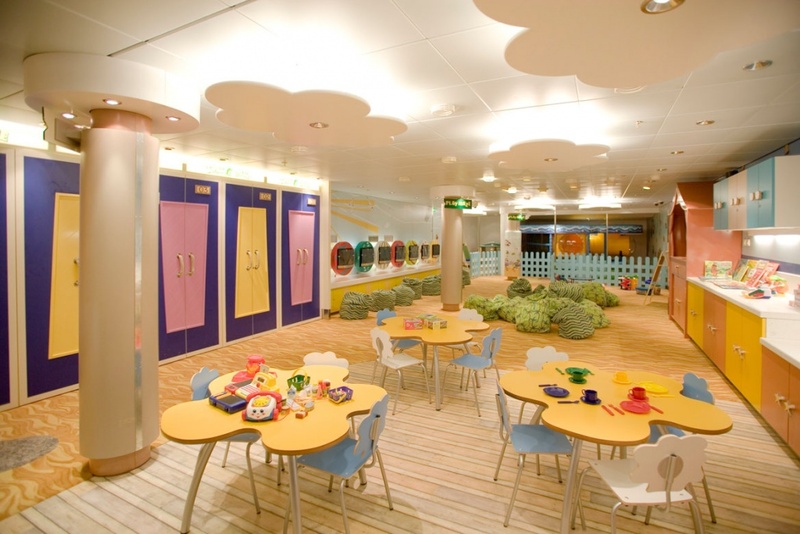 On Deck 14, fitness oriented passengers are drawn to the sports deck for a game of quoits or table tennis, or a jog on the Astro Turf track. The Aqua HealthSpaFitness centre will soon have you feeling toned and terrific. Here you can work out on treadmills, stationary bikes, elliptical machines or weight machines. You can also sign up for yoga, Pilates or a fitness boot camp. 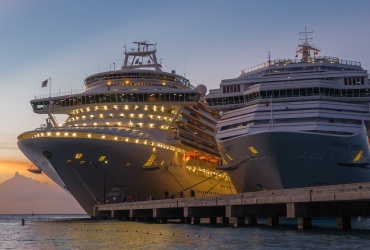 Pampering is a special treat popular with cruisers. The HealthSpaFitness centre is the place for massage, facials, teeth whitening, hair-care and more. 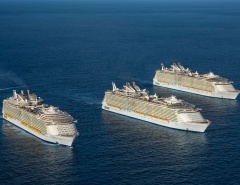 Family cruising has become extremely popular in recent decades and P&O’s Pacific Dawn has embraced the trend. 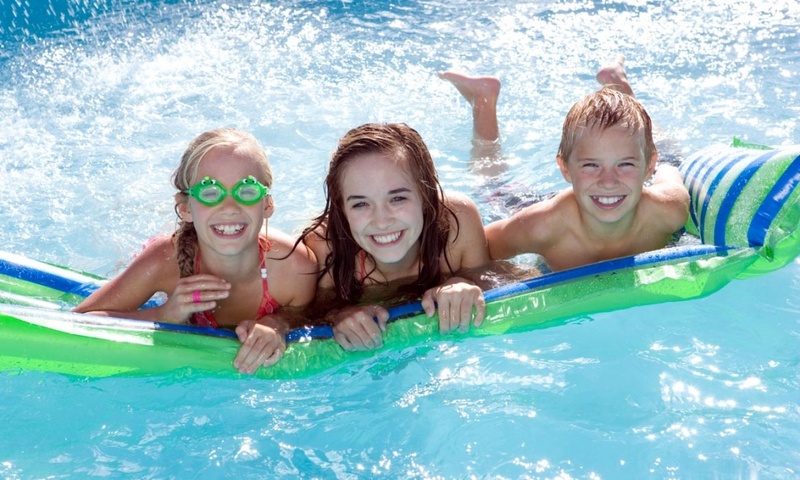 Kids are treated to a range of clubs for all ages, and the activities keep them happily occupied. Dedicated Pacific Dawn staff ensure that children are supervised in activities ranging from movies, talent shows, disco nights, arts and crafts and the list goes on. In fact, apart from meal times and around the swimming pool, the kids are rarely seen and are too busy having fun elsewhere on the ship. 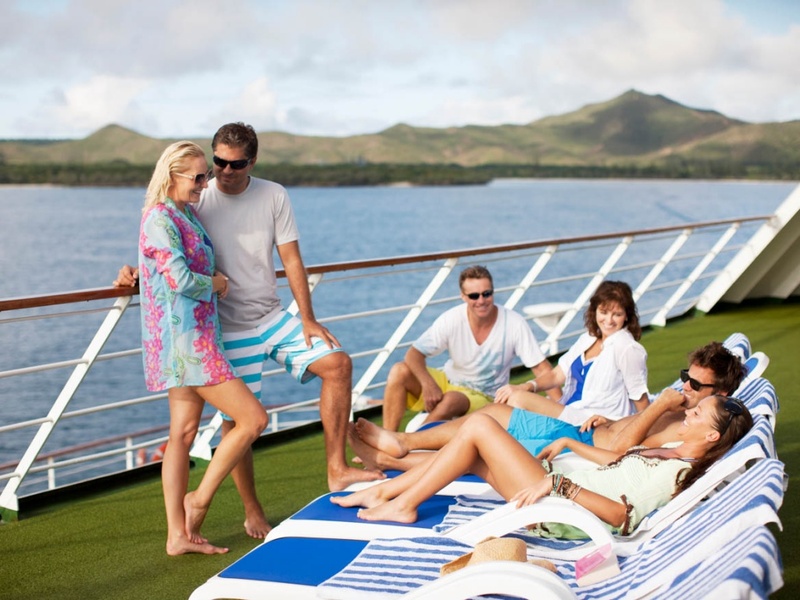 Pacific Dawn focuses on the South Pacific, and passengers love the islands and shore excursions. Fantastic tropical scenery, welcoming islanders and brilliant sunshine guarantee the trip of a lifetime on Pacific Dawn. Click on the image below to download the Pacific Dawn deck plans. 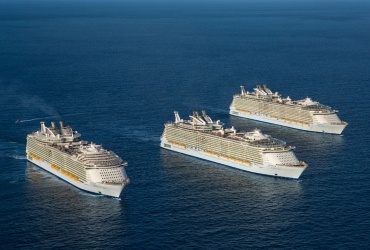 What’s your experience with this popular cruise ship? Let me know in the comments!